Thank you to the Okemo Valley Regional Chamber of Commerce for naming us "Member of the Month"! Chamber Director Carol Lighthall stopped by our recent Board of Directors meeting to make the announcement. Shown in the photo are (from Left): Production Coordinator Eric Chatterjee, Board President Fra DeVine (with Rosie), V.P. 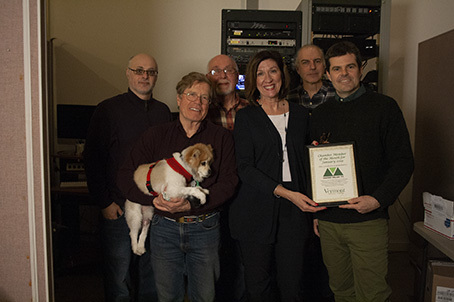 Lou Krefski, Chamber Director Carol Lighthall, John Cama (Okemo Valley TV Board member), and our Executive Director, Patrick Cody.